Yes, it’s that time of year again when we take a day to appreciate — perhaps worship — the hairy, slow-moving, adorable creatures that are Costa Rica’s virtual mascots. It’s International Sloth Day! What, you say? You didn’t know? Since 2010, the exact calendar day upon which we celebrate the sloths has varied, and conservation groups consulted in Costa Rica weren’t sure whether this year’s celebration falls on Oct. 17 or 18. It’s hard to imagine but sloths have not always been loved by humankind. Eighteenth century French naturalist Georges-Louis Leclerc called sloths “the lowest form of existence.” Because of such historical disdain, biologists today actually know very little about sloths. 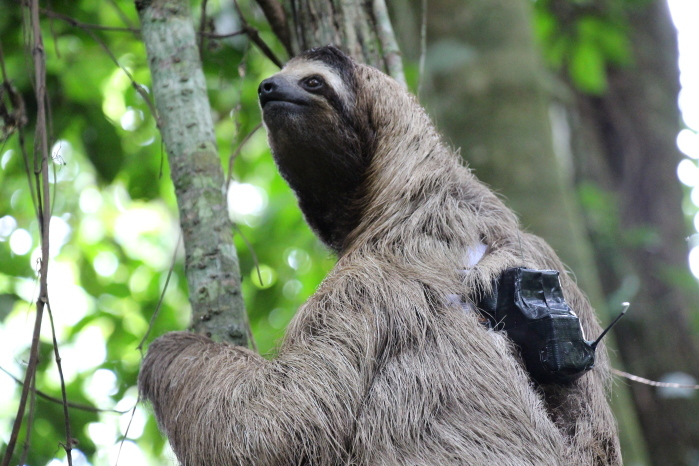 But a researcher at Costa Rica’s Sloth Sanctuary is trying to change that by strapping backpacks equipped with a GPS, an accelerometer and a compass to track the sloth’s daily activities. Once the data from the GPS is downloaded, a supercomputer assembles a 3-D image of the sloth in Google Maps, which shows exactly what the sloth was doing at any given moment. Last October, a vet in Herradura performed what may have been the world’s first cesarean section on a sloth. The pregnant momma sloth had fallen out of a tree on hotel grounds in Manuel Antonio and was still seriously injured when contractions started. 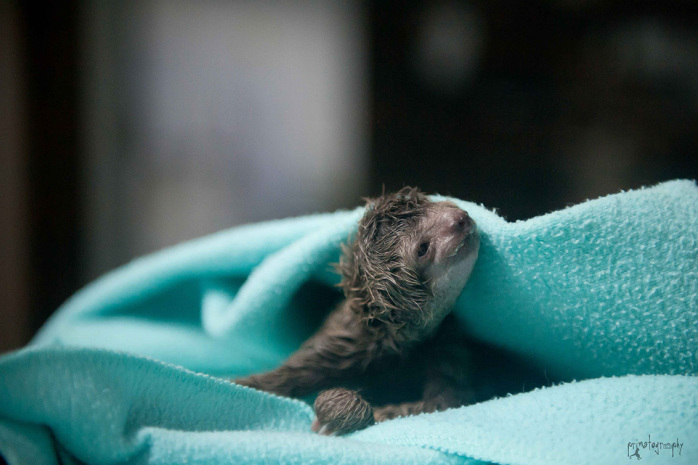 A wildlife worker took the sloth to a vet, who determined that the baby was breached. He decided the only chance for saving mom and baby was a C-section. A sloth on a tree, a moth on a sloth, sloth poop on the moth, algae on the sloth poop. Enough said. Modern-day sloths are pipsqueaks compared to their Pleistocene Era ancestors. The Museum of San Ramón has a replica of one of the giants — based on bones found in the area. Giant sloths and their contemporaries roamed large swaths of South and Central America, and the specimen on display, at just 9 feet tall, is a shrimp. After all, it had to fit in the room. Giant ground sloths often grew up to 15 feet tall. Now how cute are they? Buttercup the sloth, who lives at the Sloth Sactuary in Limón province, became a superstar earlier this year when American Apparel decided to put her likeness on a T-shirt. Given the company’s mixed reputation, some were concerned about how it would turn out. Gerald Richards, a volunteer consultant for the Sloth Sanctuary, said there was some talk about dressing Buttercup in a bikini. Whether the idea was serious or not, Richardson put the kibosh on it. Plus, 30 percent of proceeds from the T-shirt sales goes to the Sloth Sanctuary. Can sloths swim? Find out here. Put a sloth on your body! 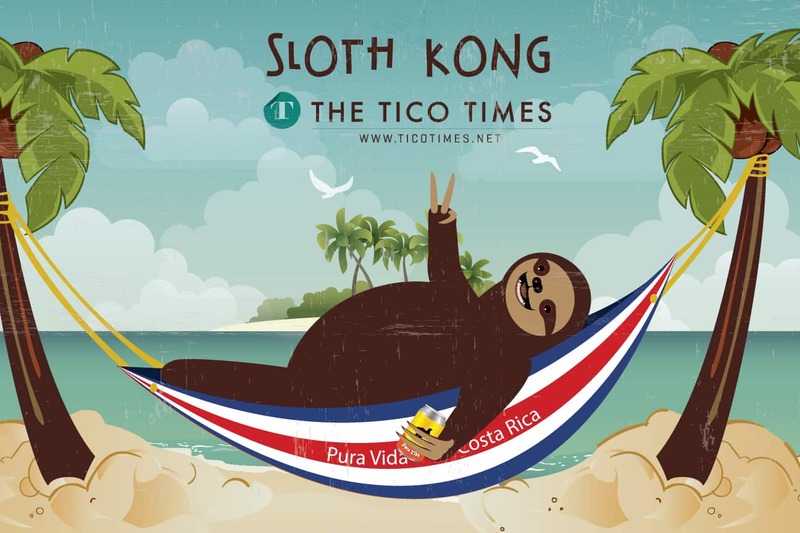 Check out all our Sloth Kong-themed gear at The Tico Times store.